1. Combine the dressing ingredients; season. 2. Cook the couscous following packet instructions. Cook the carrots in boiling water for 1–2 minutes, until tender. Drain and put both in a large bowl. Pour over the dressing, add the herbs and toss well. 3. 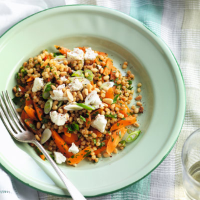 Place on a platter and scatter with the feta, salad onions, pine nuts and sumac.